Soft tissue healing consists of 3 phases: regeneration, repair, and remodeling. Most fractured bones heal within 8 weeks. Total healing time for a body part that has been severely injured commonly takes 9 -12 months. Remodeling of new soft tissue cells and developing strength take the longest and at times can take more than 1 year. Seek the advice and treatment of a Physical Therapist if you get injured. One moment he was running and the next he was on the ground. Adam knew that he had broken his ankle. Each day he jogged through the park on his five-mile run. On this crisp fall day, he delighted in the sun flickering through the trees and the colorful leaves covering the path. Unfortunately, these leaves also covered a hole in the way. When he raised his shirt to wipe the sweat from his face, he stepped in the 6-inch hole. The ankle twisted and popped and Adam crashed on the dirt trail. A sharp pain pierced the outside of his ankle, making it impossible for him to stand. In just a few moments, Adam was surrounded by fellow runners, coming to his aid. They helped him up off the ground and supported his weight as he limped to the car. He only he needed his right foot to drive and it wasn’t injured, so Adam drove himself to the emergency. A friend met him there and helped him into a wheelchair. The x-ray indicated that Adam had fractured the distal Fibula or the “outside” ankle bone. The bone was misaligned, and the decision was made to fix it through a surgical procedure. The surgeon inserted numerous screws and a plate to support and align the fibula. There were strict non-weight bearing orders given by the surgeon because too much pressure could ruin the surgical procedure and knock the bone out of alignment. For the next month, he was told not to put weight on the ankle. After that, a follow-up set of x-rays would be taken to determine when he was allowed to transition to full weight bearing. The devastating effects of a severe injury like a broken bone go much further than just the fractured bone. 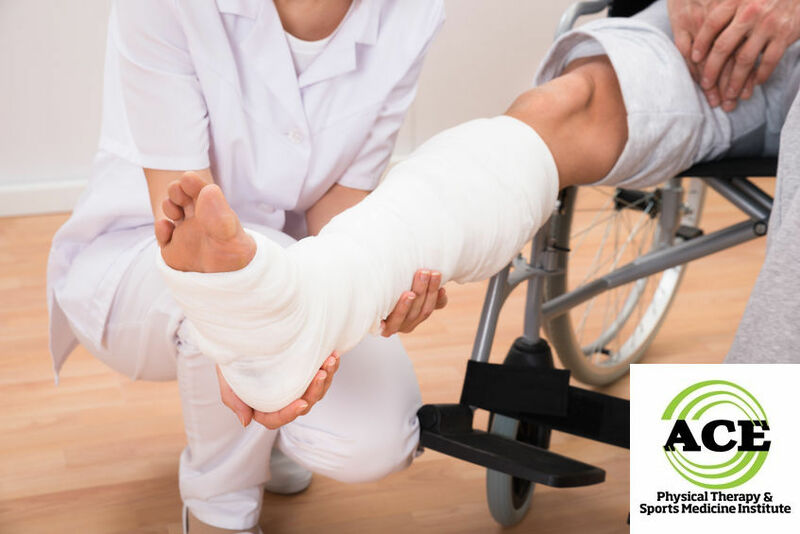 The entire limb is negatively affected due to the fracture but the lack of motion and activity that occurs during the healing phase can cause more issues than the original fractured bone. More surgeries to fix fractures (Open Reduction Internal Fixation, ORIF) are performed in today’s healthcare system compared to 20+ years ago because of the secondary complications that occur when someone is immobilized and/or non-weight bearing. Bones can heal in 6-8 weeks in most cases. The use of a cast or splint will be needed nearly all of the time. The ORIF surgeries are performed to align the broken ends and speed up healing. The bone will require some weight bearing forces to be placed through it to stimulate more bone cell development. At some point in the healing process of a broken bone, the x-rays will reveal enough new bone growth to warrant a change in the original precautions and restrictions that the surgeon places on the acutely repaired bone. At that time, the bone will respond to the stresses and strains applied to it and produce more bone. Soft tissue injuries also need time to heal. Most soft tissue repairs itself within a 2-3-month period of time. During this time period, the body part will have to be protected and in some cases significant motion restrictions will in place. Sometimes certain soft tissue injuries cannot heal on their own, and they need to be surgically corrected to help speed up the healing process. The restrictions placed on a surgically corrected body parts or severely injured areas will usually involve limiting the use and motion within the involved limb. Sometimes the person will be told to remain non-weight bearing for a prolonged period of time. The restrictions will affect the entire limb and in some cases the entire body. In most cases a severe injury will limit the person’s ability to perform any kind of exercise therefore they will lose muscular strength and endurance, cardiovascular fitness and basically become extremely deconditioned. The Physical Therapist’ role in rehabilitating a particular severe injury will include a full body workout routine. The Therapist will guide the patient and educate them in proper exercises to perform to strengthen their entire musculoskeletal system. The entire body is “connected” and a great deal of emphasis must be placed on the core musculature regardless of the injured body part. Building muscular strength and endurance takes a very long time and is dependent upon the amount of effort that is applied by the patient. It is not uncommon to have to strength train for 6-9 months to develop enough strength that somewhat resembles the amount that was present during the pre-injury time period. Cardiovascular fitness is slightly easier to regain following a period of inactivity but still requires several months to fully return to the pre-injury status. Obviously if the person was not in great cardiovascular shape prior to their injury, it will take them a shorter time to return to pre-injury levels. Severe injuries, with or without surgeries will have a negative effect on the entire body. The muscles will lose strength, joints lose motion and the cardiovascular fitness will decrease quickly. Most severe injuries can be rehabilitated fully but it requires a great deal of time and consistent effort. Seeking the advice and treatment of a Physical Therapist will ensure that the involved person performs the proper routine to regain their pre-injury function as quickly as medically possible.